A very spacious unusual apartment situated to the side of the building with a large terraced area with views down the road to the sea. Immediate access is through patio doors from the parking area into the main family room/kitchen. This room opens out into a fantastic space for dining, viewing TV, playing, cooking and relaxing. The lounge has Sky Freeview TV, DVD/Video players, 3 and 2 seater sofas and a sumptuous cream carpet making this room a great entertainment suite/chill-out room or 3rd bedroom when using the self-inflating blow-up bed; it also serves as a great space for the younger family members to be occupied. The hallway allows storage for boards and pushchair etc. Full WiFi is provided. The double bedroom has a wet room style en-suite and the 2nd bedroom has a two single wooden beds. There is also a wooden cot in this room. From this room there is access to the terrace via a single patio door. (Key can be removed by parents with young children) The family bathroom has bath/shower over. 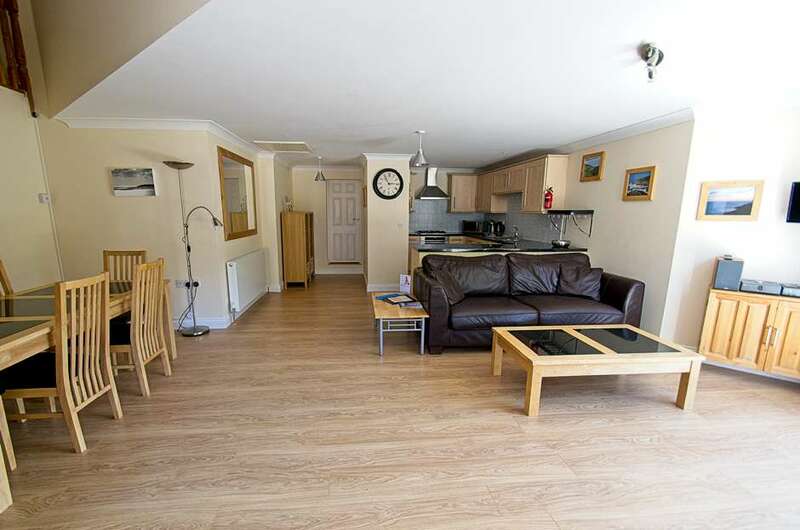 This spacious apartment's locality to the beach and village makes for a superb base for your holiday in Woolacombe. Parking space for two small cars (or one larger) directly outside the entrance, at owners own risk. High chair and cot. The owners accept a dog at a charge of £20.